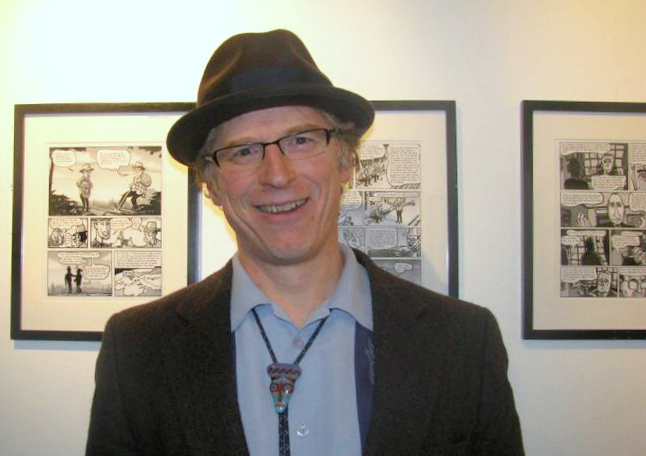 Peter Dunlap-Shohl drew editorial cartoons for the Anchorage Daily News for 25 years. He was diagnosed with Parkinson’s disease in 2002. 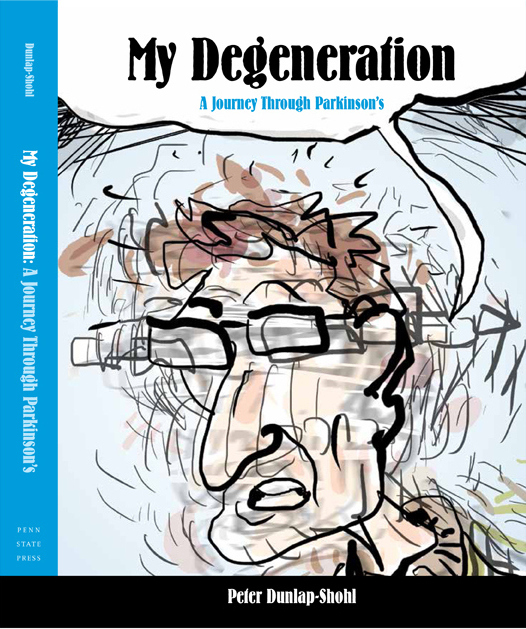 Since diagnosis he maintains two Parkinson’s blogs, ‘Frozen Grin’ and ‘Off and On, The Alaska Parkinson’s Rag’, and published his first graphic novel ‘My Degeneration’ with Penn State University in 2015. I was diagnosed with Parkinson’s disease in 2002. After a desperate and fruitless search for hopeful information on the condition, I thought there was a need for a compact, easily digestible guide to fight the despair people can feel when diagnosed. 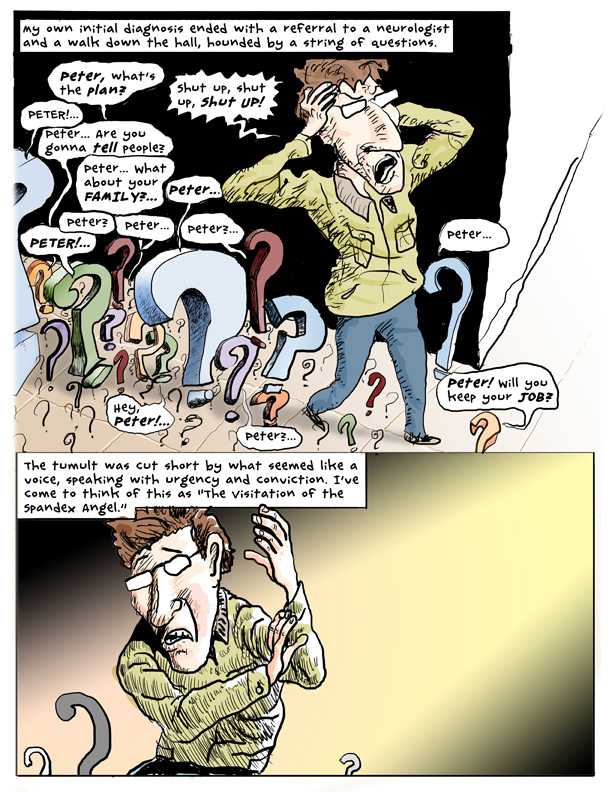 A ‘graphic novel’ format, besides compressing the information, would potentially bring that information to people who ordinarily would not seek it out. The fact a person could write and illustrate a book over 10 years into their diagnosis could be comforting in itself, no? 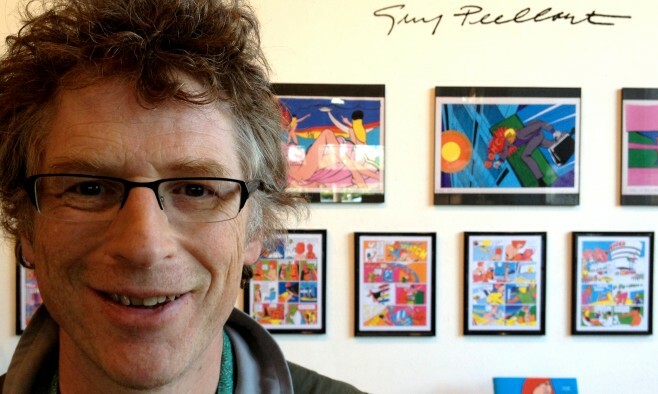 Working as a newspaper cartoonist, I also posted my drawings to blogs – my friends encouraged me as I started documenting my life with Parkinson’s disease. 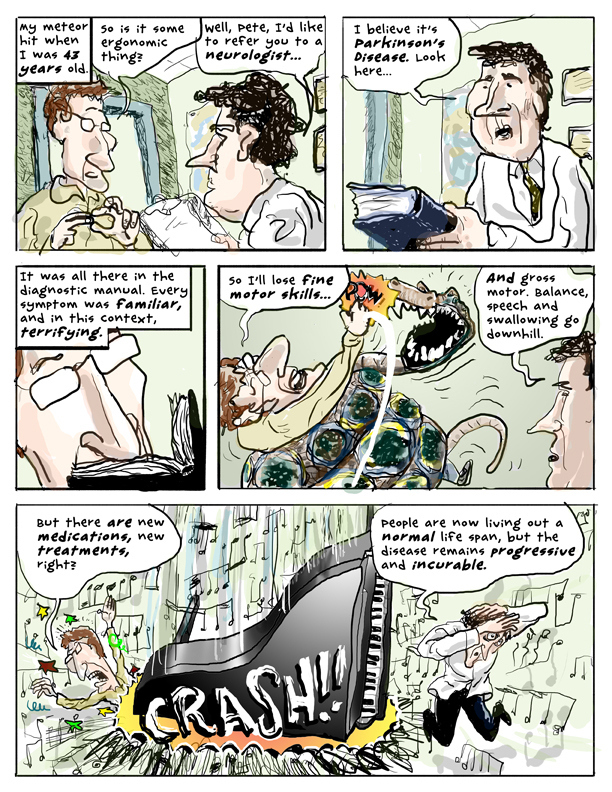 The comic-book is based on my blog ‘Off and On, The Alaska Parkinson’s Rag’. My editors found lots of material posted there promising, and I created the first draft from that. It took another year to re-draft and complete a second version. Drawing the book was like climbing a mountain, weeks, months and eventually years of sustained effort. With such a big project there was time to polish and refine everything. Not that I‘m a perfectionist, but it has been tremendously satisfying to have the time to do each page justice. I’ve surprised myself as I’ve looked back and realised that, in retrospect, I hadn’t understood certain aspects of the disease while actually living it. I was shocked to recognise how confused I was in the period immediately following my diagnosis. And I was also surprised at how angry the diagnosis and disabling nature of Parkinson’s made me. The relative clarity of hindsight has been an unexpected comfort. That being said, my editors thought that the initial manuscript had just too much humour. They felt the reader would be ‘pummelled by punchlines’, and tire out. So I took half the humour out – THAT was hard. 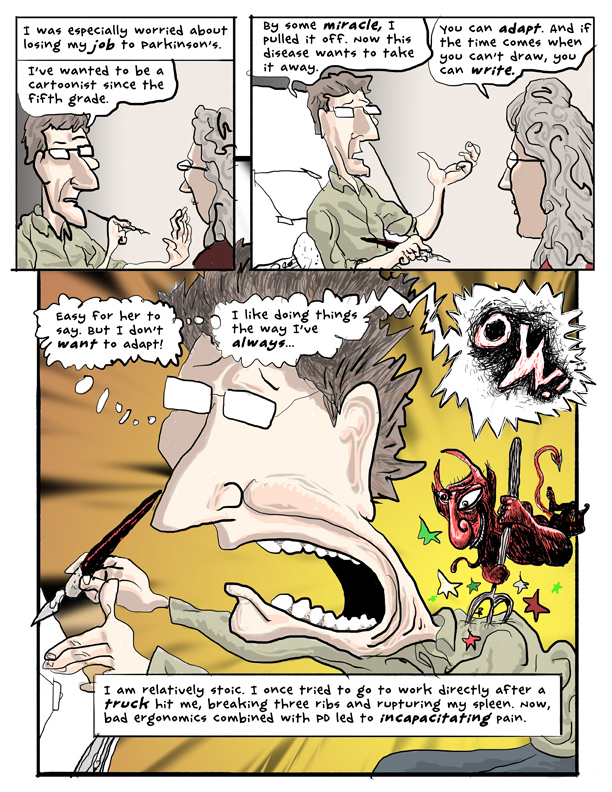 It takes roughly two days to do a full-colour page – although the time it takes depends on how complicated each page is, and how I’m doing with my medication. It’s tough to draw when your ability to control movements is impaired (this is called dyskinesia). I try to match my symptoms to an appropriate activity. If I am wildly dyskinetic, I’m probably better off riding my bike or working out on my elliptical trainer. But if I’m having freezing problems, that’s the time to draw. I love a spontaneous, free line – this is difficult to achieve with a disease that clamps down on your muscles. At the other extreme you can have excess motion when too much medication builds up in your bloodstream. You get a marvellous spontaneous line for sure, but not where you want it! It can be frustrating and time consuming to get the line that I had in mind. The disease causes intolerable pain when I draw by hand, so now I use an electronic drawing pad and a desktop computer. God bless the ‘undo’ command! I have, without intending to, become an amateur Parkinson’s advocate. Here is my testimony: don’t panic. Learn all you can about this fascinating disease, manage your meds well, and exercise like your life depends on it. Which it does! The amount of worry in your life will go up as you deal with problems that are physical, mental, emotional and financial. This can put stress on couples and I’ve seen it blow up marriages. A second constant is that Parkinson’s is isolating – it is, literally, difficult to get out. When you do go out, symptoms like shuffling and drooling are embarrassing. When you speak, your voice can be frequently undermined by the disease, and talking can seem futile. Caregivers can also become isolated if they struggle to manage their responsibilities. Friends, family and work colleagues can be amazingly helpful if you can let them know what they may do to help. It’s best not to keep your condition secret, as it’s probable that you will do better over time if you remain engaged with the wider community. It’s possible to enjoy many, many good years and continue to make a contribution with a bit of luck and lots of discipline. The community in turn will benefit more from you as an active member. In an early section of the book, I report on some of the thoughtless and harsh things said and done by medical professionals. There is a tremendous variety in doctor/patient relations. Some doctors have great bedside manners, others are egregiously callous. Clearly, we have a way to go in informing medical professionals about the finer points of Parkinson’s care. As healers they need the patient’s trust to do their jobs well. Patients need to protect their interests by becoming as knowledgeable as possible about this disease. Don’t be shy about letting your doctor know what you think about treatment, but be sure you can back up what you say. If you can document your position well, you will earn your doctor’s respect. This is especially important if your doctor is not a movement disorder specialist. The intricacies of Parkinson’s are endless and if your doctor is also treating MS patients, migraines, dystonia, epilepsy, and Alzheimer’s, it can be tough for them to be up on the very latest in Parkinson’s disease treatment.